Situated just off Park on 22nd Street, the tiny Tamarind Tea Room is adjacent to the proper Tamarind restaurant you may have heard so much about. Their Indian fare is legendary, and the Tea Room certainly reflects the level of service and quality consistent with the larger restaurant. My Lady Dining Partner (MLDP) and I visited Tamarind Tea Room for lunch and ordered off their limited menu of inspired sandwiches, salads and appetizers. They make up for the short entrée list with a lengthy tea inventory and a page and a half devoted to desserts. The physical menu itself is adorable—a small leather binder with the simple Tamarind logo embedded on the cover. You’ll feel at home flipping through the pages, taking in the various delectables the Tea Room has to offer. For my entrée, I opted for the tikka malai sandwich. Chunks of chicken straight from the tandoor oven filled a delicious wrap, with onion and bell pepper making an appearance. MLDP ordered the spinach kofta sandwich with mint-chutney dressing that looked quite good. On another occasion, I tried the saag paneer sandwich that was extraordinary—giant pieces of paneer cradled in a wrap with fresh leaves of spinach. It was scrumptious. I had tried the mango cheesecake during my first visit to the Tea Room, and declared it one of the best cheesecakes I had ever tried. Well, a visit to Tamarind Tea Room wouldn’t be complete (to my mind) without getting the mango cheesecake again, so that’s what I did. With a creamy, mousse-like texture, the cheesecake sits delicately on a wide plate in two beam-like structures, with dots of caramel as garnish. 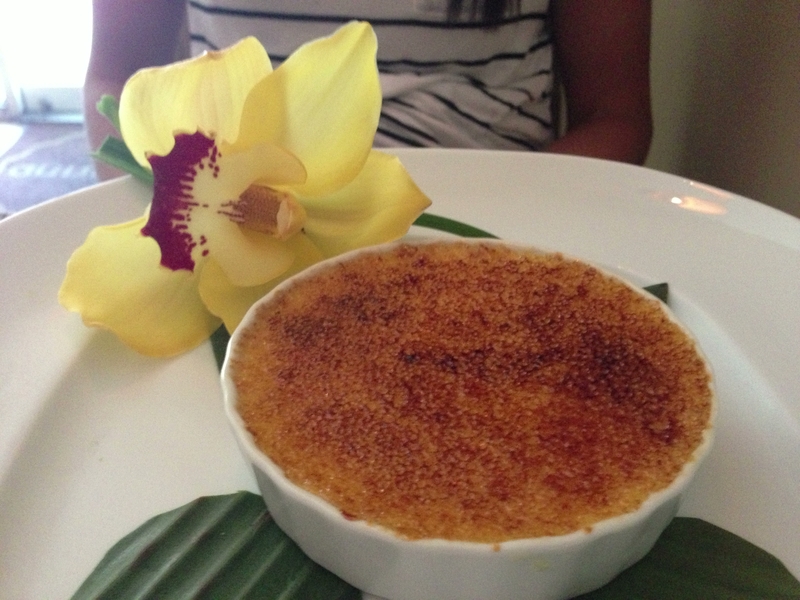 MLDP wanted crème brulee, so she ordered the lemon and cardamom inflected dish, which had a thin, crisp exterior of burned sugar—delicious! We also ordered coffee, and even that was good. 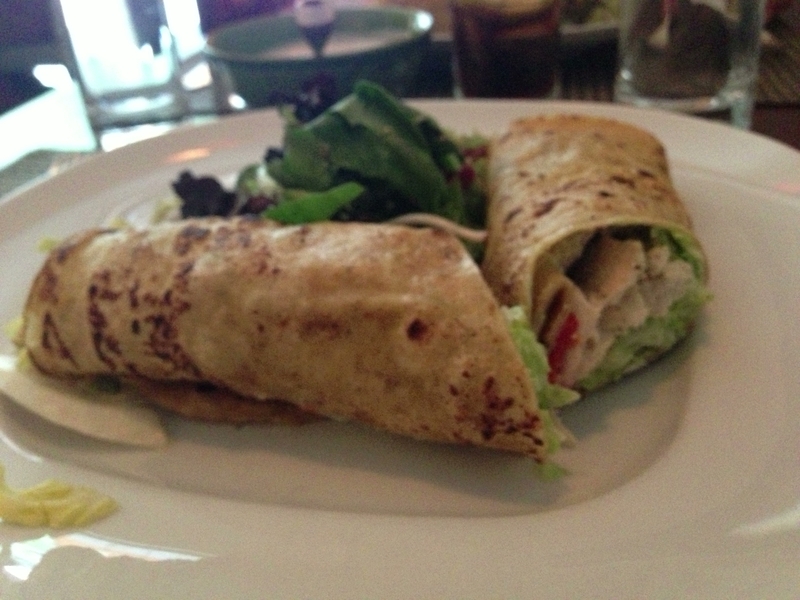 If you’re in the Flatiron neighborhood, make a point of stopping at Tamarind Tea Room for lunch. You won’t be sorry. Take the 6 to 23rd Street and walk south to 22nd Street. Alternatively, take the N/R to 23rd and Broadway and walk south one block, then turn left onto 22nd Street.